One presenter stands in a Los Angeles office interfacing with the background image projected behind her. The other presenter stands right next to her, working in tandem with the background image, but is physically based in Ohio. Welcome to SightDeck, where Hollywood’s green screen technology meets corporate and educational applications. Since 1976, Ultimatte has proven itself a leader in green screen compositing technology designed for television and motion picture applications. Ten years ago, Ultimatte began to develop a similar technology without the green screen for corporate, presentation and educational applications. 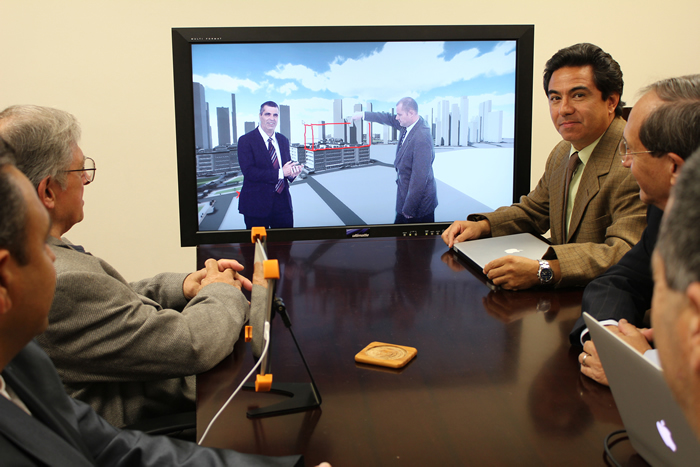 SightDeck’s goal was simple: deliver green screen-inspired technology to the corporate world, assisting in distance learning, sales pitches and other related applications. To achieve this and create a solid, plug and play package, Ultimatte turned to Gefen for a selection of digital signal management solutions that would prove to be extremely reliable in the field. That goal has already been achieved. Demonstrated at the 2014 NAB show in Las Vegas, SightDeck creates a mask of the presenter(s) in real time and enables complete interactivity with background graphics, created beforehand. SightDeck is essentially a hardware system, including a screen, camera, projector and server card backed by some Gefen signal management hardware to enable seamless connectivity. When two or more SightDecks’ are combined in tandem, you can double your imagery with two simultaneous outputs. So your colleague in Ohio can present in real-time right alongside you. Presenters can see each other and they can reference each other. In this way, SightDeck enables the creation of panel discussions with people located all over the world, looking as if they are all in the same room. SightDecks’ high definition camera supports two images: the masked presenter(s) and the projected background graphics. It will work with most projectors provided they have less than 3 frame delay and minimal thermal drift. This ensures the real-time seamlessness of the presentation. It completely supports touch screen technology so the presenters are able to manipulate and interact with the projected content and other presenter’s personal movements in a seamless fashion. With touch screen technology applied to the projected background image, the presenter can control, edit, change or add any content being projected. “Anything you can control on the PC, you can control on the touch screen behind you,” explained Sauve. All content can be simultaneously output in high definition format, streamed live and recorded with a first generation quality output. Editing tools on the GUI can appear projected on the background image or hidden from everyone but the presenter. Everything is user controlled. A video conferencing codex is also built into the system so someone can dial in and be heard as well as seen by the presenter or by everyone participating. The system is totally interactive and contains multilayered transparencies to bring people into the picture, visually dissect issues, collaborate and problem solve. Gefen’s USB Extender is also included for remote touch screen applications. “Gefen is an integral part of the SightDeck solution, and is listed in the specs,” added Sauve.